This inexpensive tool is a must for sharpening your ski pole tips! This inexpensive tool is the best hand tool we have found for sharpening carbide tips. To roller ski on asphalt it is very important to have sharp carbide tips. It’s a good idea to quickly sharpen your tips before each outing as sharp tips make for a more pleasant experience and dull, worn down tips are harder to sharpen. We now offer three versions. 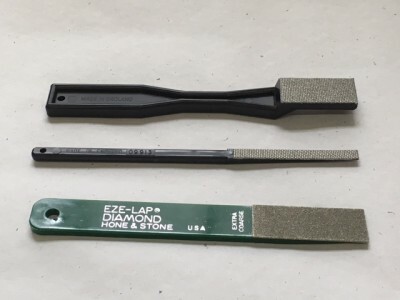 The original green handled extra coarse grit file has a sharpening pad 3/4″ x 2″. The wide black handled file has a slight angle to the file head with a pad 3/4″ x 1.5″ that many find a bit more coarse than the green handled file. The narrow black handled file has a pad 1/4″ x 2 3/8″ that is great for fine tuning, as the narrower pad makes it easy to see where you are working.